National Vegetarian Week (NVW) is the annual awareness-raising campaign promoting inspirational vegetarian food and the benefits of a meat-free lifestyle. Celebrated by the Vegetarian Society since 1992, the Week is now an established event that gets bigger and better every year. What will you be doing for National Vegetarian Week this year? Animal Aid: Vegan Easter Eggs and Chocolate Bunnies Do I spoil you or what? But Do I though? Yeayyyy! For all you fat bottoms out there who like, or used to like, Cadbury's creme eggs here is the vegan version. Yes that's right you heard me correctly, vegan Cadbury creme eggs! Catriona my daughter very generously sent me a big box of chocolates from Animal Aid and there was a creme egg in there with the package. After a few seconds to get over the excitement I bit the top off and devoured it there and then in a full frenzied chocoholic maniacal episode. Just to check it wasn't a dream, some viral induced halucinogenic attack, I checked the Animal Aid website and guess what ?? they have more - you can enjoy them too! They also have this great new video that you can send to your non veggie friends to get them to think about Meat Free Mondays. 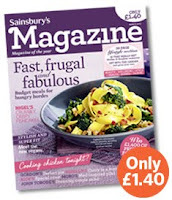 This months UK supermarket chain Sainsbury's magazine challenges it's readers with the headline "So you think you know what a vegan looks like?" They showcase a "super fit and stylish new breed of vegans"
Be there or be square - come to the Vegetarian epicentre of the UK for what is promising to be even more fabtastic than last year - with catering by Heather Mills' new V Bites lunch should be a bit more reasonable than Brighton Centre's commercially suicidal effort last year. That's why it's been moved to Hove so expert ethical caterers can be brought in. Some of the UK’s finest veggie food producers gather together at the first ever Brighton Eco Veggie Fayre on Saturday March 20th from 11am – 6pm, with the organisers expecting thousands of people through the door to experience the delights of one of the UK’s fastest growing lifestyle choices – the veggie diet. Some choose to be veggie on health grounds, others because they are concerned about the welfare of animals, but a growing number of people from all backgrounds are going veggie for one reason only – the food! Veggie food has long since shed the earnest but rather dull hippy image of the 70’s, and with leading UK veggie caterers at the Brighton Eco Veggie Fayre including the likes of V Bites, Heather Mill’s flagship Hove based restaurant, alongside food producers with the likes of the award winning Fry’s and Redwood ranges available to sample free, there’s a huge choice to be had. With a talks room, a cookery demos area, and an entertainments arena as well as an all day licensed bar, there’s a full line up to suit all tastes and with an admission price of just £3 for adults and £1 for kids and OAP’s, Tim is expecting a full house. The show is organised by Yaoh and sponsored by Beanie’s Health Foods, V Bites, Chunkies and Macrobiotic Shop, and supported by Excellart, Ethical Singles, VeggieVision, Foods for Life and Flax Farm Linseed. How many times have you heard this? "I'm not a vegetarian but......."
"I don't eat much meat..."/ "I'm almost vegetarian" / "I just eat fish and a little chicken"
Despite the urge you occassionally may have to shake these people you should try to remember that it is these well meaning but non commital stand on the fence vegetarian spectators that keep vegetarianism and veganism moving forward. Without the vegetarian spectators, vegan dippers and semi - conscious consumers the fully conscious consumers and vegans who get it (get the fact that ill health and devastation of the planet are mostly down to eating the wrong way) would have a much harder time. All those soya, rice, nut and oat milk dairy alternative products and veggie sausages wouldn't be still so abundant on the shelves were it not for all the part time healthy eaters and environmentalists trying to do their occassional bit. Granted it is fast approaching the point where a bit is not enough to save the planet, but even a bit is better than nothing when it is millions of people. So Thank you Gwyneth Paltrow and your Goop blog - "I'm not a vegetarian but..." is pretty lame, especially considering your husband's passion for logic and reason. I'm no longer a fan of yours since you draped yourself in fur but....... thank you for plugging Paul McCartney's meat free monday and laying down the facts for your celebrity and fashion obcessed followers. 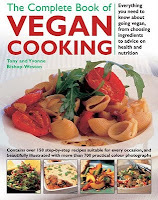 The recipe book is currently being reprinted and new copies available in time for National Vegetarian Week. A sell out in just 5 months on Amazon is not bad at all - clearly the world is waking up to a vegan diet as a solution for health and environmental issues.